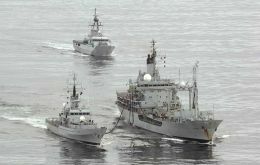 The British Government told the United Nations Monday that Gibraltar had entered a new non-colonial constitutional relationship with the UK and described as outdated the UN criteria on de-listing former colonies. Legislators from Chile's environmental caucus reacted angrily last week to reports that state-owned mining company CODELCO is violating legal pollution limits for their waste water &ndash; in some cases by more than 700%. 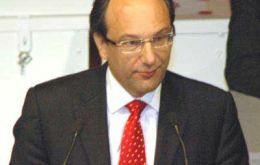 Senator Guido Girardo (PPD) and Deputy Alejandro Garcia-Huidobro (UDI) demanded that company executives be personally held responsible for their company's excesses, and denounced current sanctions as insufficient. 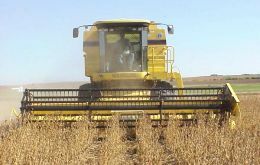 Argentina seems to be heading for a record crop of 100 million tons, five million more than the 2006/07 record, and with even higher prices, in money terms this could mean an overall additional four billion US dollars. 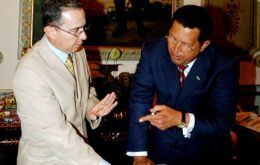 Ailing Cuban President Fidel Castro telephoned into a television show with Venezuelan President Hugo Chavez Sunday, in his first live media appearance in Cuba since his health crisis nearly 15 months ago. Brazilian president Lula da Silva reiterated he was against a hypothetical reelection for a third mandate but did not deny the possibility of running again in 2014, according to a Sunday interview with Folha do Sao Paulo. The president also pointed out that the last time he got drunk was in 1974. First Lady, Senator and presidential candidate, Cristina Fernandez de Kirchner is the wealthiest of all presidential hopefuls running for Argentina's Executive seat in Casa Rosada next October 28, reports the Sunday edition of Buenos Aires daily Clarin. In with the new...; Worship in our schools? ; Chile vows support for Argentine claim; Man guilty of sexual assault; FIGAS remains leader-less. This Gibraltar General Election has proved the saying popular with all politicians behind in the polls that the only vote that counts is the one on the day. 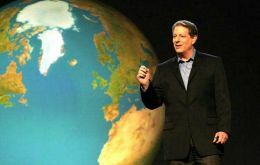 Former US vice president Al Gore has shared the 2007 Nobel Peace Prize with the UN's Intergovernmental Panel on Climate Change.